BLUE CUT GLASS VASE home decor, jewelry, decor, decorations, electronics, fountains, floor mats, art glass, vases, garden essentials, fireplace screens. 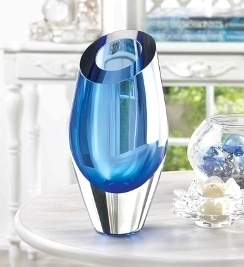 Dramatic design and beautiful shades of blue make this glass vase a stunning addition to your decor. The angled top of the vase makes this artistic vase a great style statement that doesn’t need any accompaniment. Item weight: 6.8 lbs. 5" diameter x 9½" high. Material(s): GLASS. Weight 5.6 pounds. Dimensions 5" x 5" x 9.5".